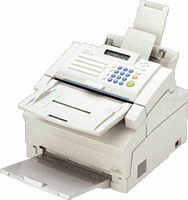 For anyone looking for a hard-working laser plain paper fax at an affordable price, this is the ideal answer. Built specifically to handle smoothly and efficiently the everyday needs of the small or home office, it has a reception print speed of 6 pages per minute. With its compact design, this exceptionally simple to install and operate machine will fit comfortably into work areas where space is limited, which means quality laser plain paper faxing will always be close at hand. Choose from the genuine and compatible toners and maintenance kits below.